The Fiat 500L has been given a range of updates for 2017, with exterior styling tweaks, improved infotainment and more customisation options. The Fiat 500L MPV will be priced from £16,195, with deliveries starting in September. The engine line-up remains largely the same, with turbocharged and non-turbo 1.4-litre petrol engines, available with a respective 120PS or 95PS. 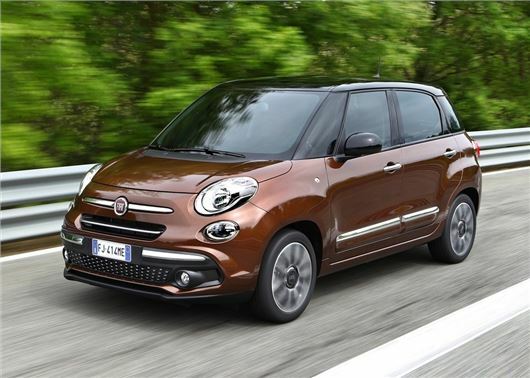 Fiat will also offer the 2017 500L with its latest two-cylinder 0.9 TwinAir petrol, along with two MultiJet diesels - a 95PS 1.3-litre engine and a 120PS 1.6-litre unit. Fiat hasn't released any CO2 or fuel economy figures for any of the engines in the 2017 500L MPV, so it isn't clear at this stage if there will be any significant gains in claimed economy. As things stand, all will be front-wheel drive; with the 1.3 MultiJet being the most-efficient with an official 70.6mpg. The four-cylinder diesel will be available with manual or Fiat's five-speed Dualogic automated manual transmission. All other engines will get a five-speed or six-speed manual 'box as standard, depending on engine output levels. The 2017 Fiat 500L MPV won't look radically different from outgoing version, with revised bumpers and a new chrome studded front grille. Fiat has added more chrome to the side and rear, while the fog and reversing lights are now built into the underside of the bumper. There will also be more personalisation options, with Fiat promising a bewildering 1500 customisation choices for the interior. The range is now spilt across three trim versions- Urban, Cross and Wagon. Urban models are - surprise, surprise - designed for the city, while the 500L Cross will get rugged - yep, you've guessed it - crossover styling, with front and rear skid plates and increased ground clearance. An enhanced traction control system will also be available for the Cross, with mud, snow and sand handling optimisations, which should make it apt for light off-roading. Infotainment options should be better, with a new version of Fiat's Uconnect system, with hands-free Bluetooth interface, audio streaming, text reader and voice recognition. All 500Ls get a restyled multifunctional steering wheel and five-inch infotainment display as standard, mounted in the centre of the dash. Range topping models will get a seven-inch colour touchscreen with Apple Car Play and Android Auto. The Wagon will sit on a longer wheelbase - 4.3 metres compared to the standard 4.2 - and get seven seats as standard. The Wagon will also offer more boot space - 493 litres - compared to the standard 455 litres when the third row is folded. Good that the 1.4 turbo is back as the car needs this unit. Has been absent from the configuratorn for a while. Leaving only derv and the underpowered 95hp petrol. Perfectly useful vehicle with the 120hp petrol turbo. Cost effective. About as cool as log fire. Good. I'd have one.